This guy’s a real piece of work. The updates tell us he was arrested by Toronto police and he was also fired from the hair salon where he worked. This isn’t the first time he’s been acting out at pro-life demonstrations, either. This kind of behaviour MUST have consequences. It’s shocking that there are people walking around our cities who think they can physically attack anyone they disagree with. Toronto police have arrested Jordan Hunt, 26, of Toronto, and charged him with assault following his roundhouse kicking a young woman Sunday. That video is at the bottom. Hunt, who turned himself in, is charged with eight counts of assault and seven counts of mischief. He appeared in court at Old City Hall Saturday morning for a bail hearing. Things got heated between Marie-Claire Bissonnette, 27, and Hunt when Bissonnette challenged Hunt, accusing him of vandalizing her pro-life signs. Hunt begins by challenging Bissonnette’s views, asking her opinion about abortion relating to women who are raped. At that moment, the man planted his feet, stuck out his tongue and delivered what authorities described as a “roundhouse kick” that struck Bissonnette in the shoulder, sending her phone tumbling through the air. “I meant to kick your phone!” he yelled. The video was recorded during the Life Chain demonstration in Canada on September 30. The man fled and police arrived at the scene, Toronto Police Service spokesman Gary Long said after the incident. Hunt has also been identified as the man who knocked over a sign and argued with pro-life demonstrators last summer in a video filmed by Canadian Centre for Bioethical Reform (CCBR). Hunt has shut down his Instagram account and has not responded publicly about the incident, nor has he returned calls from media. Fox News carried the story as well. 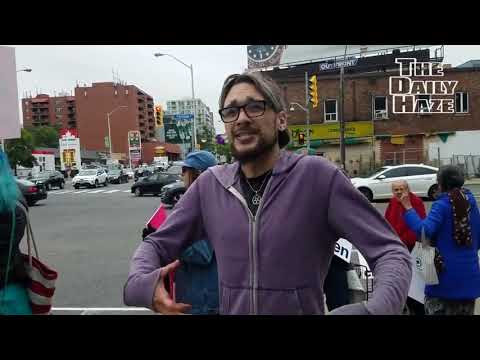 This entry was posted in Uncategorized and tagged activist, arrested, assault, Captain's blog, fired, hair stylist, Jordan Hunt, kicked, love, Marie-Claire Bissonnette, name and shame, Noble Studio 101, pro-life demonstration, Toronto. Bookmark the permalink.